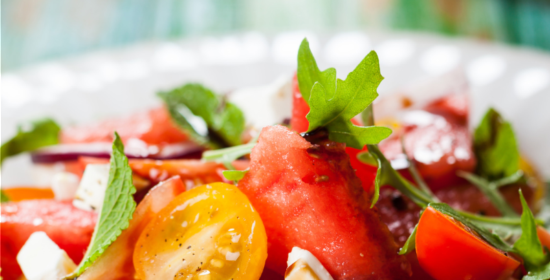 Watermelon Tomato Salad over Arugula is a great way to enjoy garden or farmer’s market produce. Drizzle with Balsamic Vinaigrette with a secret ingredient! DIRECTIONS – if not using pre-washed Arugula wash well. Arrange a bed of arugula on each of four dinner plates. Cut watermelon into chunks and add to large glass mixing bowl. If you’d like to use grilled watermelon instead of fresh watermelon, grill thick slices of watermelon, before cutting it into chunks if . Slice each tomato into twelve or more wedges. If using grape tomatoes, slice in half or in quarters. Add tomatoes to bowl. Slice onion thinly, then cut slices in half. Gently mix watermelon, tomatoes, and onions. Spoon onto evenly onto the four plates of arugula. Add about one-fourth cup cheese of your choice, cubed or crumbled, to each of the salads. Optional – add a few fresh mint leaves to each salad. Drizzle with Secret Ingredient Balsamic Dressing. And serve. DIRECTIONS - add all ingredients to a blender. Mix well. Add more or less salt and pepper to taste. 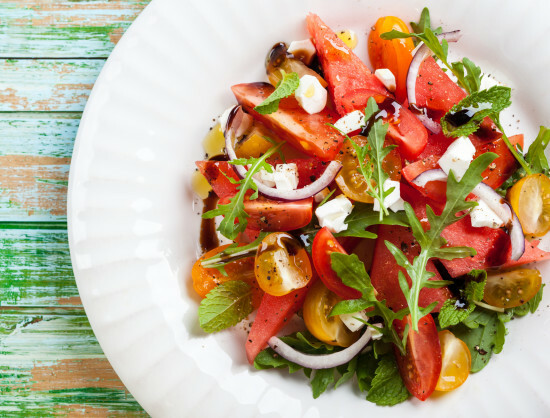 Metatags: Watermelon Tomato Salad over Arugula is a great way to enjoy garden or farmer’s market produce. Drizzle with Balsamic Vinaigrette with a secret ingredient!